Sometimes it’s challenging to motivate for outdoor fun when it is so chilly outside. However, being active outdoors is a great way to enjoy the mountains in a whole new way. Not only is it less crowded, but there are no bugs to contend with! To make the most of your outdoor adventure and not be cold and uncomfortable, layer your clothing so you don’t wimp out and head back for the cabin. 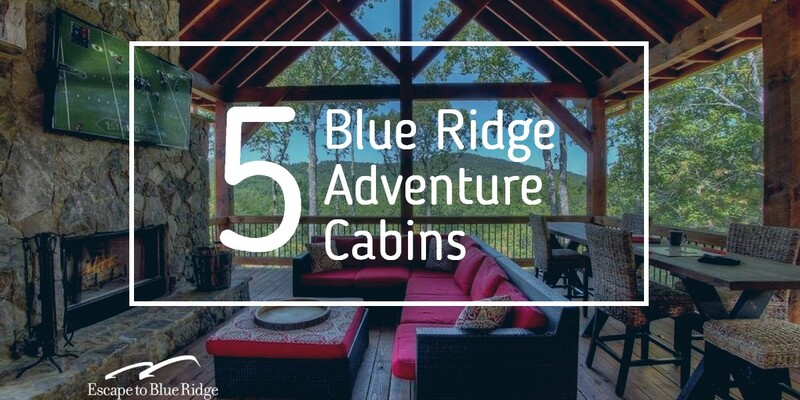 Here are a few inspiring North Georgia cabin rentals to keep you active in and around Blue Ridge. The Aska Adventure Lodge is located in the much sought after Aska Adventure area. Did you know Aska is the Cherokee Native American word for “winter retreat”? However, this cabin is perfect in every season. The Lodge has three bedrooms and three bathrooms and can easily accommodate ten people with king beds in the two master suits, a queen bed in the guest room, and two futons in the loft and game room. This retreat is conveniently located less than five minutes from the quaint town of Blue Ridge, Georgia. Nearby access to the Toccoa River and Lake Blue Ridge is easily accessible. Our friend, Dell Neighbors, at Fly Fishing North Georgia would be happy to take you on a guided fly-fishing trip to the area’s many cold-water streams and rivers. When you return from a great day of fishing, you can throw your freshly caught trout on the grill of your expansive deck and reflect on the successes of the day. Cap off your evening by lighting the outdoor fireplace and relax on the deck as the sun sets behind the expansive Blue Ridge Mountains. Vista Ridge is a distinctive Georgia mountain cabin rental that offers the peaceful get away from your everyday life that you are craving. Named for the spectacular view that overlooks the Toccoa River and stretches all the way to Tennessee and North Carolina, this four-bedroom, three bath home is your perfect base camp to explore the Blue Ridge area. To get a better feel for the view, saddle up a horse with our friends at Blanche Manor and go on an adventure through the unspoiled beauty of the mountain wilderness. After a long day on the trails, soothe your sore muscles in the hot tub and watch the sun set behind the mountains. Back inside, turn on the gas fireplace and snuggle into the leather couches. Before your weekend is over, challenge your partner to a game of pool in the game room and make the looser take you out to a fabulous dinner at Harvest on Main. Eagles Landing is as bold, majestic and unique lodge that is the epitome of rustic elegance. This spacious custom home has seven bedrooms to accommodate nineteen guests. Situated directly on Lake Blue Ridge, this spectacular showplace has incomparable views of the surrounding mountains. The hand-carved spiral staircase spans four floors, from the unique loft down to the terrace level where you will find the “grown-ups’ game room”. There are three decks spanning the length of the home, a hot tub, swings, and a picnic table to enjoy views and privacy that cannot be found anywhere else. Close by you can channel your inner eagle and zip through 165 acres of beautiful North Georgia mountain property with our friends at Zipline Canopy Tours of Blue Ridge. Here, you’ll experience the mountains from the treetops, you’ll zip into the valley, soar over pastures, and cross over Fighting Town Creek. From 75’ in the air you can squeal with delight take off on 6,000 feet of cable, crossing thirteen platforms and three walking bridges. It’s impossible to walk in the woods and be in a bad mood at the same time. Fortunately, the mountains are rich with hiking trails to explore and Take a Hike cabin is the perfect home base. Beautifully situated on Mt. Pisgah, this cabin overlooks absolutely fantastic mountain views. It also has three massive decks to enjoy them and from where you’ll be inspired to plan the many and nearby open-air activities that surround you. This home has great sleeping accommodations for up to 7 people and is a perfect set up for two families vacationing together or a good-sized group. Explore the Cohutta Wilderness just off of your back porch where you can pick from delicious blueberry and blackberry bushes for snacking along your easy hike to a waterfall, cave or to Colonel Magnum’s memorial. A quick ten-minute drive will get you to major hiking trailheads including Dally Gap, Jacks River, Benton Mackaye and Hemptop. Whichever route you choose, you will find peace and tranquility both in the woods and back at the cabin. You have a lot of choices in Blue Ridge cabin rentals, but if you’re looking for comfort, privacy, and great views, Wine Down is the perfect vacation destination. This beautifully appointed mountain retreat is the kind of place that invites you to settle in, wind down and relax with a glass of wine, like its name suggests. The cabin’s four roomy bedrooms beckon you with comfort, but the real appeal is outside. Wine Down’s covered outdoor living room on the main deck has a gas grill, table for eight, plenty of seating, and a 60” TV above the wood burning fireplace. Wine down is located on Aska Road less than four miles from the shopping and restaurants of downtown Blue Ridge. A short drive will take you to the nearby winery at Serenberry Vineyards. Sit back, relax, and enjoy a mountain wine tasting. Their Skeenah Red is a perfect Merlot-Cab blend, but if you prefer something sweeter, you should definitely try the Apple-lachian. Fruity and sweet, it’s like a little apple pie in a bottle!